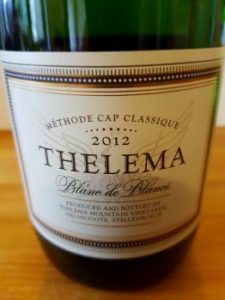 There was a time when Méthode Cap Classique was the preserve of a few specialists but now just about every self-respecting cellar feels compelled to have one in the range and Thelema in Stellenbosch is no different. From 100% Elgin Chardonnay, it was left on the lees for 28 months. The nose shows a hint of reduction, before citrus and green apple plus a subtle yeasty note. The palate meanwhile is lean and understated with bright acidity and a fine mousse – best drunk as an invigorating aperitif. Price: R170 a bottle. Could you please advise what ‘ The nose shows a hint of reduction’ means. Hi Jonnie, It’s complicated but “reduction” is basically shorthand for “smelly sulphur compounds”. Think “burnt matchstick” or “gunsmoke”.